The Archelon was the largest turtle that ever lived on Earth, and this skull is from the largest and most complete Archelon specimen that has been found. The skeleton was found in the Pierre Shale, associated with ammonites from the Didymoceras cheyennense Zone. The skull shape is unusual, designed for crushing, not biting. Like the extant Leatherback turtles that sometimes feed on cephalopods, this animal probably used its large bony jaws to crush and feed on ammonites and other large molluscs such as oysters and clams. The original of this specimen is in the Vienna Museum of Natural History in Vienna, Austria. 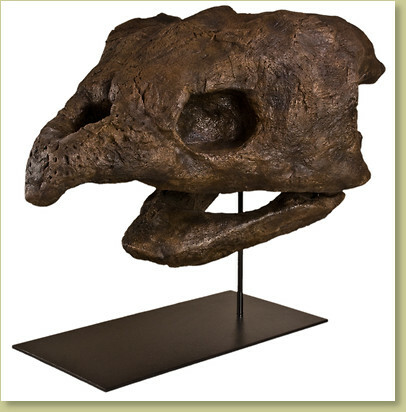 We are very pleased to be able to bring to you a precise reproduction of this amazing skull. It is presented on a painted steel base (as shown), or can be produced as a wall mount. Notes May take approximately one month for production. Check with us to see if an earlier date is possible.